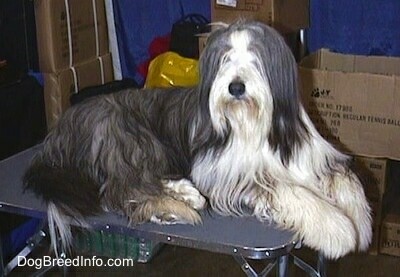 The Bearded Collie is a medium-sized, strong working dog. The body is long and lean. The head is large, broad and flat with a moderate stop. The muzzle is relatively short, strong and full. The black nose is large and square. The medium-sized ears hang close to the head and are covered with long hair. The teeth are large and meet in a scissors bite. The eyes are wide set and are in tone with the coat color. The tail is carried low unless the dog is excited. They have a shaggy, waterproof, double coat that hangs over the entire body including the chin (hence the name "Beardie"). Beardie pups are born black, blue, brown or fawn, with or without white markings and often lighten, first fading to a light gray or cream as the dog matures. The coat color changes several times before it reaches the adult color. The final coat color is somewhere between the puppy coat color and the color the coat is when the dog is about a year old. 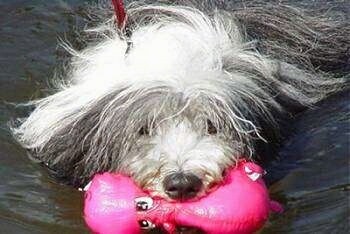 The Bearded Collie has an air of cheerful, happy-go-lucky, tail-wagging humor. It is affectionate, playful and lively, and can make a perfect companion for children. They love to be with their people. An unexercised Beardie that is left alone without anything to do will not be happy, and you may not be happy with what it does while you are gone. If you must leave your Beardie, be sure to take it for a long jog or walk prior to leaving. Known for its "bounce," the Beardie is exuberant and high-energy; without enough daily mental and physical exercise it may get itself into mischief. It is very trainable for many activities. An owner who displays a natural authority is a must as Beardies think a lot and will be headstrong if he sees you as meek. One needs to be calm, but firm, confident and consistent when dealing with this dog. Set the rules you wish the dog to follow and stick to them. Obedience training is recommended. The Beardie is a natural herder of people and animals. They are noisy barkers, but are not watchdogs. They should not be shy or aggressive. When well balanced between leadership and exercise they will be stable and self-confident. The Bearded Collie originated in Britain and is one of the country's oldest breeds. 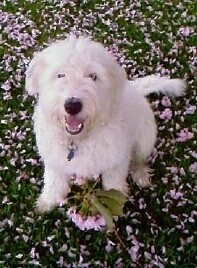 The foundation of the breed was started in 1514 when a Polish sea captain made a trade with a local Scottish shepherd. He traded three of his Polish Sheepdog (Polski Owczarek Nizinny; PON) for a ram and a ewe. 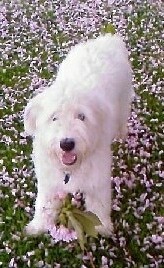 The shepherd then bred these dogs with other herding and flock dogs such as the Old English Sheepdogs (bobtails) and the Komondor. The dogs were used as herding dogs for centuries in Scotland and became known as the "Highland Collie," the "Highland Sheepdog" and the "Hairy Moved Collie." They were excellent workers, herding sheep and cattle for local shepherds. The name "Bearded" comes from the long hairs that grow on the chin, making the dog look like he has a beard, and the name "Collie," which is the Scottish word for herding dog. The Bearded Collie almost became extinct during the Second World War. 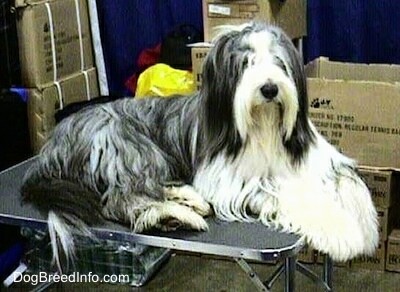 In 1944 Mrs. G. O. Willison from Great Britain bred a pair of Bearded Collies, resurrecting the breed. In 1967 the first litter of Beardies was whelped in the USA. The breed was first recognized by the AKC in 1976. They are still to this day considered a rare breed. Some of the Beardie's talents are tracking, herding, agility, competitive obedience and performing tricks. 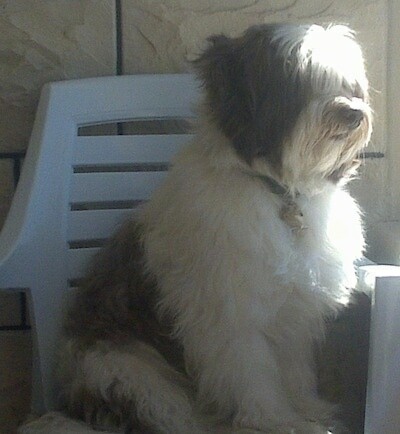 "Teddy is a gorgeous 6-month-old Bearded Collie puppy. He is white all over apart from a few piebald patches. He is deaf in his left ear and is the most docile Beardie I have ever met. Teddy lives in Scotland and his favourite thing to do is paddle in the nearby lake. We got him when he was 15 weeks old and we though he was big then but you should see him now; he weighs in at 18.70 kg (over 41 pounds). Teddy's mother is a working sheepdog and his father is a show-type Bearded Collie so he has the beauty of the show lines but, most importantly, the brains of the working lines. His only bad habit is digging in the kitty litter box. He is such a gentleman and is top of his puppy training class! Teddy's favourite treat is liver cake which I make myself and he is mad for tuna fish also. Teddy lives with 3 other dogs—Smartie, a 15-year-old Jack Russell Terrier, Bonnie, a Bearded Collie x Border Collie, age 10, and Millie, a 2-year-old Border Collie. 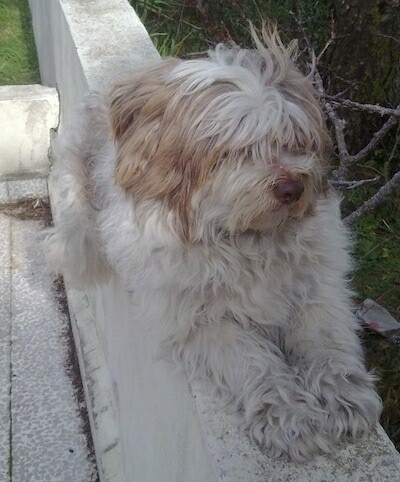 I have lost count of the number of times Teddy has been mistaken for a Labradoodle, this is what most people assume he is, but he has also been called a Husky and an Italian Spinone Only one person has ever recognized him as the noble semi-working Bearded Collie that he actually is. 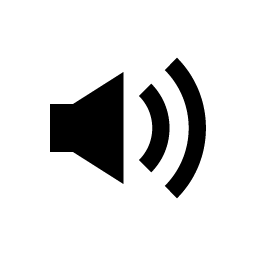 Due to his hearing impairment he can find it hard to locate a sound or voice so will spin round again and again, which makes onlookers think he has gone mad, until he spots the source of the sound. When he does hear you though, he always comes back when called." "I don't really think Teddy is a truly balanced canine due to the fact that he is a little skittish sometimes and gets spooked by things easily. Apart from that, though he is a real sweetie and I feel so lucky to own such a fabulous dog! I watch the Dog Whisperer whenever I can as it’s on every day here but being in Scotland, I don't think they are recent episodes and mostly reruns but I watch the reruns anyway as I love Cesar's techniques and I have a lot of respect for him and the work he does. The episodes about the 'Katrina' dogs were particularly moving and while all the TV "dog trainers" over here use silly techniques that don't seem to work, the methods Cesar practices are truly phenomenal and his natural way with the dogs is a pleasure to watch over and over. I have almost finished reading his first book “Cesar's Way” and will move on to the others as soon as I'm done. Thanks to Cesar Millan, I understand not just my dogs but all dogs much better and I am very grateful for that as it has helped me with caring for and training dogs." 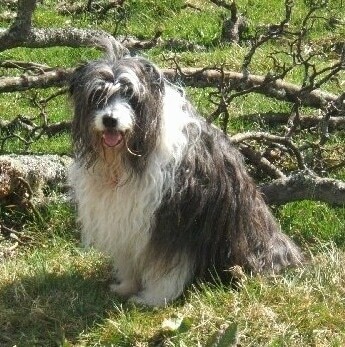 "This is a picture of Bonnie the Bearded Collie who lives in Scotland. She is nearly 10 years old and is still very spirited. She has strong working instincts and her favourite pastime is herding our younger dogs while they are playing. This is a photo of her while on a walk around Loch Lomond."